I made this rug, "Pepper's Relax Mat" for the Portland Handweavers Guild guild booth in the 2017 ANWG Conference. Our booth theme is recycle/reuse, and guild members were asked to include a story about making the piece to include in the booth. Click on the photo to see a larger view and read the story. New book! How to Make Ply-Split Braids & Bands is now available. Step-by-step instructions for 25 ply-split braids and 3 ply-split bands, 222 pages and 500 photos! Click on the image and you will go to a page where you will see more details. John and I have made a new video where I show and describe each of the 12 baskets in my book "How to Make Ply-Split Baskets". I also page through the book while discussing each basket, to give you a glimpse of the 400 photos and step-by-step instructions. The focus of the book is on ply-split structures and geometric design. Once you master the techniques, you can use them to create your own designs, from hats to free-form sculptural works. Click on the image below to watch my latest YouTube video, "Ply-Split Braiding: The Waffle Braid". If you would like to try making the Waffle Braid, you can order a kit with cords and step-by-step photographs. Click on the "more info" icon on the upper right of the image to read more about the video. You can subscribe to my YouTube Channel to be notified whenever we upload a new video. I will post updates there on my own work as well as anything I find interesting about tablet weaving and ply-splitting. John and I are working on many other braid designs. Each braid will available as a kit as we complete the instructions. Sometime in 2014, I will assemble everything into my new book, How to Make Ply-Split Braids. Please send me an e-mail if you would like to be notified when the book is available. I believe the wall hanging I'm holding is the world's first ply-split QR code, and it works! See a larger photo and read details about how I made it. Also, my first try at a ply-split mobius strip, made with Danish cord. I've been working on adding photos and descriptions to my Ply-Splitting Gallery and my Tablet Weaving Gallery. 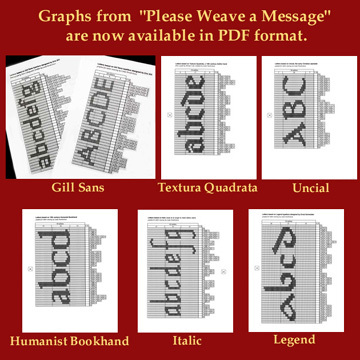 John and I have also made two tablet weaving videos for YouTube about my book Please Weave a Message: Instructions and Graphs for Tablet-Woven Calligraphy. Click on the image below to watch my YouTube video, "Make the Ply-Split 'Waves' Braid". You can order a kit with cords and step-by-step photographs. Instructions for this braid are also in my booklet, Great SCOT! A Beginner's Guide to Ply-Split Braids in Single-Course Oblique Twining You can see a photo of the 'Waves' braid made into a necklace in my Ply-Splitting Gallery. 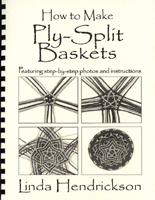 How to Make Ply-Split Baskets is the first book on ply-splitting as a basket technique -- step-by-step instructions for 12 baskets,180 pages and 400 photos! Click on the image and you will go to a page where you will see thumbnail photos of all of the baskets. Then you can click on any thumbnail to see a larger image and an overview of how the basket is made. Little Mermaid Gripfid Holder -- a size 9 gripfid is the Little Mermaid's head! This is a kit with paper cords. A ply-split basket featuring the endless knot design. Cords made from Wraphia II paper ribbon. Cords in the base are in warp/weft alignment, and the sides are worked in POT (plain oblique twining) with extra twist between the splittings. Read more about this basket. New on my Kits page. I had this idea in Fall 2008 -- create the appearance of traditional three- and four-strand braids with ply-split braiding. Of course, the cords go through other cords, not just over and under. The structure is SCOT (Single Course Oblique Twining) with extra twist between the splittings at the edges. Many of you have memories of our teacher, mentor, and friend, Peter Collingwood, who died peacefully and unexpectedly in his workshop on October 9, 2008. I would like to invite you to write down your special memories of Peter -- a few sentences or a paragraph -- and send them to me to post on a page called Remembering Peter Collingwood. You can also e-mail me jpeg images. I will post what you send me, without editing. Please be sure to include your name, city, and country. Click on the image below to watch a 5-minute video on how I use the Bradshaw cordmaker in my studio. In this video, I show a few ply-split objects that I have made, including jewelry, ornaments, a mat, a small rug, and two baskets. Then I show how to make a cord using paper ribbon, the material that I used for the cords in the baskets that I showed earlier. John and I have produced the first-ever DVD on how to make a ply-split basket, and it's available now -- ordering info is on my Books and DVDs page. I also have a new kit for a ply-split basket that I call "Asilomar Basket". The kit has instructions and 4-ply cords that I make from paper ribbon. This is a design that evolved from the Ply-Split Garlic Basket. Ordering info is on my Kits page. I was invited to participate in the National Basketry Organization Exhibition "All Things Considered IV", and I made the basket on the left for the show. The exhibition will be at the Arrowmont School of Arts & Crafts in Gatlinburg, Tennessee from September 28 - November 10, 2007. The basket on the right is one I made for the Columbia Basin Basketry Guild's exhibition in Portland in Spring, 2007. It's made of Danish cord, and is 22" tall, the largest basket I've made. Photo by Shab Levy. This summer, I worked with photographer and metalsmith Randy Rasmussen on a series of "art medals". We made these pieces for the Art in the Pearl Collaborative Exhibition, which was displayed at the Museum of Contemporary Craft. Photo by Randy Rasmussen. This page updated on April 7, 2018.